wow this year is flying by! so proud of all of you (and me!) who are doing this little challenge every week - creating something, recording something, taking time for yourself even if it is only 5 minutes. don't feel bad if you have fallen behind, or if you are just joining in, you are doing something important for yourself, so make it work however you can! i was thinking earlier that there are so many things i'd like to learn. i never want to go back to school and sit exams again, but i'd love to learn how to sew my own clothes, speak fluent french, garden, knit things that are not just straight lines (ie scarves and squares for a blanket)...my list goes on! this weeks challenge is: what would you like to learn? i layered some cordoroy fabric i bought to sew something for ivy with (which hopefully i still can, now that i snuck a scrap from the corner for my card!) and some old crochet doily and stitched the panel with lines for journalling onto a blue painted card. the writing looks better than it came out in this scan - i promise! haha...i think i will also glue some notepaper on the back and compile a list of all the other things i want to learn - maybe this will help me to actually do it one day! I'm one of those who has fallen a bit behind, but I love seeing each new challenge and hope to get back on track this week. Thanks for keeping up with this and encouraging all of us even though you have so many other responsibilities! I just love looking at your creations. They are so free. I seem to be a bit trapped in what is accepted. I love that you are not. I so enjoy your positive, happy, joyful expressions. You are a breath of fresh air. Take care and I wish you to have more time than me now! If you ever come to Sweden I will teach you! 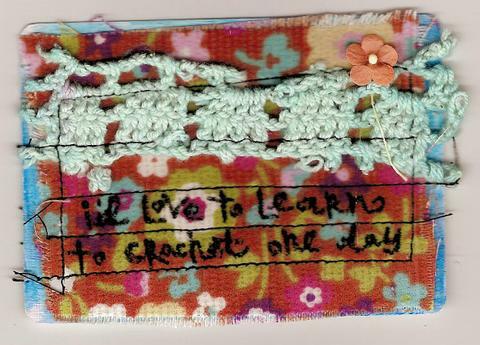 ;-) Love your card - good idea to sew the journaling lines! Liked that a lot! My card is done. A soft white one this week. Take care one and all!!! hello everybody....i am early this week...you'll see why- i had a remnant i just had to use right away. have a glorious week. find beauty in everyday. Have a day off, so lots off time to make my card! Check out this crochet tutorial on this link-a new lesson every Tuesday-lots of pics! Hi Emily!! Just wanted to say "hi" this time and let you know i popped by! I LOVE Sundays because of this great challenge! I have fallen a tad behind, but I will get caught up. Thanks for the inspiration! your friend Becky looks like a hoot! Here is my card this week...great prompt! Great prompt. I've been thinking lately of all the things I'd like to create. Most of them require sewing-which I am no good at. But thought I might try to learn. So this will be a fun card for me!! Your card is great! I would love to crochet better. I have to do it right handed as it was how I was taught but Im left & it gets confusing!! I would love to enjoy your wonderfull Challenge too ;-)! But I have a question before. Do you sandpaper the cards before painting them? hello everyone! hope you had a great weekend! Thanks to everyone for stopping by and checking out my cards this whole time, you really are a fabulous group of ladies. Anyways, here is my card for the week.. thanks again! great prompt as always, Emily.